Store all components at 4 degree C until their expiration dates. Small volumes of CytoSelect 384-well Cell Transformation Assay, Fluorometric assay kit vial(s) may occasionally become entrapped in the seal of the product vial during shipment and storage. 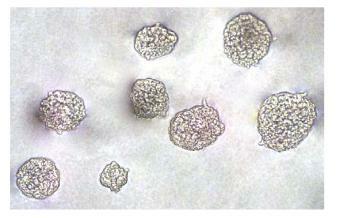 If necessary, briefly centrifuge the vial on a tabletop centrifuge to dislodge any liquid in the container`s cap. Certain products may require to ship with dry ice and additional dry ice fee may apply. Background: Neoplastic transformation occurs via a series of genetic and epigenetic alterations that yield a cell population that is capable of proliferating independently of both external and internal signals that normally restrain growth. For example, transformed cells show reduced requirements for extracellular growth promoting factors, are not restricted by cell-cell contact, and are often immortal. Anchorage-independent growth is one of the hallmarks of transformation, which is considered the most accurate and stringent in vitro assay for detecting malignant transformation of cells. Traditionally, the soft agar colony formation assay is a common method to monitor anchorage-independent growth, which measures proliferation in a semisolid culture media after 3-4 weeks by manual counting of colonies. Standard soft agar assays are usually performed in 100-mm or 60 mm dishes, where cells are allowed to grow inside a semisolid culture media for 3-4 weeks before sizable colonies appear. This method is quite cumbersome, time-consuming, and difficult when testing a large number of samples. Additionally, the manual counting of colonies is highly subjective; with varying colony sizes, it's difficult to determine meaningful results. 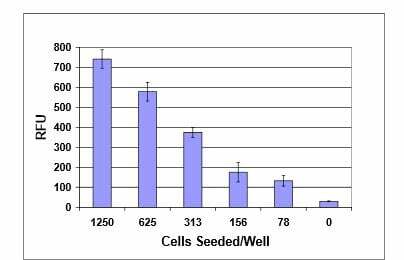 The CytoSelect 384-well Cell Transformation Assay does not involve subjective manual counting of colonies or require a 3-4 week incubation period. 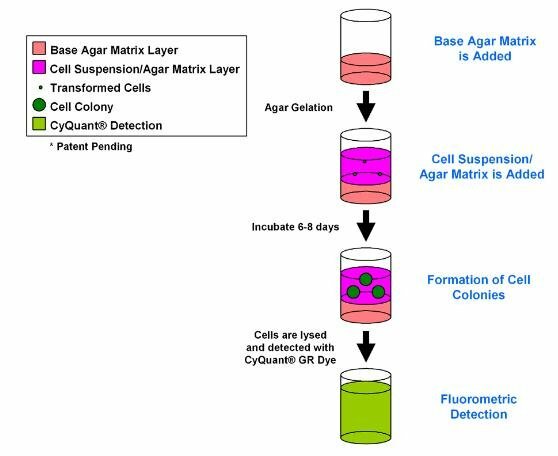 Instead cells are incubated only 6-8 days in a proprietary semisolid agar media before being lysed and detected by the patented CyQuant GR Dye in a fluorescence plate reader (see Assay Principle below). This format provides a quantitative, high-throughput method to accurately measure cell trans-formation, while the short incubation time makes it possible to assay cells transiently transfected with oncogenes or siRNA. The CytoSelect 384-well Cell Transformation Assay provides a stringent, anchorage-independent model for measuring in vitro drug sensitivity and screening cell transformation inhibitors. Each kit provides sufficient quantities to perform 384 tests in a 384-well plate. 1. Shin SI, Freedman VH, Risser R, and Pollack R. (1975) Proc Natl Acad Sci U S A. 72:4435-9. 2. Hahn WC, Counter CM, Lundberg AS, Beijersbergen RL, Brooks MW and Weinberg RA. (1999) Nature 400:464-8.